We will be celebrating 11 years this coming February at our new venue, the elegant Press Room located in north Knoxville. During this lively themed gala, attendees will have the opportunity to wear their formal best and walk the red carpet runway complete with “paparazzi”. 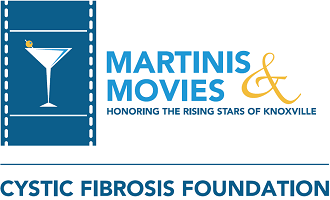 The evening will include entertainment, dinner, bar including signature martinis, beer and wine, silent and live auctions and an award show recognizing the accomplishments of our Rising Stars! The Martinis & Movies Gala draws Knoxville’s top professionals. The gala has sold out each year with over 350 attendees, so do not wait to buy your tickets to this spectacular evening. Tickets $100 ($54 tax deductible) - includes cocktail hour, plated dinner, entertainment and dancing. Table $1,250 ($790 tax deductible) - includes ten tickets along with audio and visual recognition as an event supporter at the gala. In an effort to provide a safe environment for staff and guests, we ask that you make all payments/contributions at CF Foundation events with a credit card or check. We accept all major credit cards. Thank you for your understanding.